If you want get more info about our product, please contact me feel free, I will reply you asap. 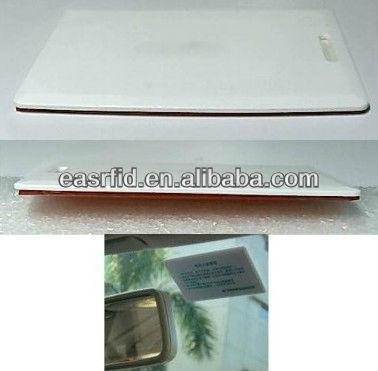 The Eastsun Car Tag(Windshield Sticker Tag) is a dedicated, passive, intelligent UHF transponder, of which operating distances of several meters can be realized. This tag complaints with the ISO standards 18000-6B or 18000-6C (EPC Global Class1 Gen2).The product family is especially designed for long range applications and offers the possibility of operating tags simultaneously in the field of the reader antenna (Anti-collision, Collision Arbitration). The tag requires no internal power supply. Its contact-less interface generates the power supply via the antenna circuit by preparative energy transmission from the reader, while the system clock is generated by an on-board oscillator. The tag offers a ceramics substrate and an adhesive for ease of installation. 1. Can we get free samples? Yes - we offer free samples, with shipping and taxes paid by the buyer. The MOQ for dry inlays is 20000pcs, for wet inlays or labels is 5000pcs. The lead time will be about 10 to 15 days with inlays, for other products please contact us for details. The payment term is T/T,L/C,Western Union,Secure payment/trade assurance(alibaba),Paypal before shipment. 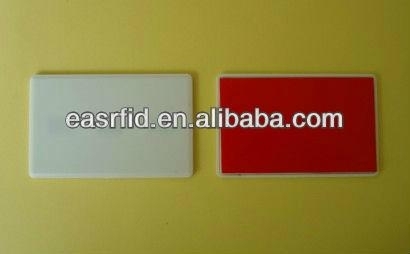 We accept to customize any types of RFID label,if you send me your details requirement.